In the footsteps of William Stafford and Robert Bly, David Lehman set out to write a poem a day. Spontaneity and self-discipline are not self-contradictory. 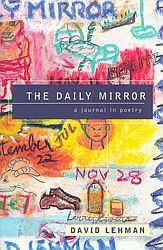 THE DAILY MIRROR is a stirring, vivid collection of poems.